Several years ago I was told by a university tutor that the novel was dead. Well, Mr Smartypants, I’ve read two dozen novels this year, new and old – and authors are still churning them out. The book, on the other hand; that’s on shaky legs. The ultra-popular Kindle – still only available by import here – has reported record sales in the run up to Christmas, while Barnes and Noble in the US have put back the release date of their new e-reader due to “overwhelming demand”. This makes Sony’s entries into the market something of a curiosity – in that you can actual walk into UK shops and buy them. 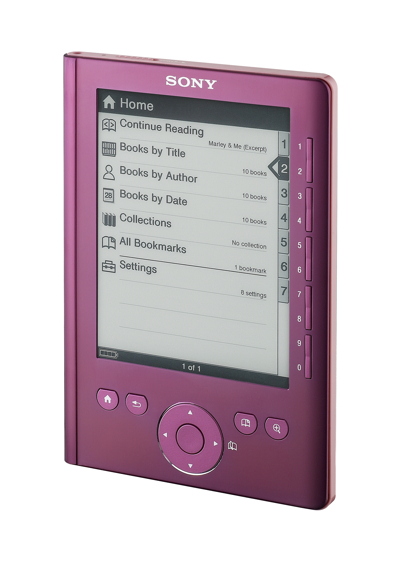 I’ve been playing with a Sony Reader Pocket Edition – the diminutive PRS-300 – this week. It’s the first bona fide e-reader I’ve had my mitts on. As an avid consumer of the printed word, I’m having a ball with it. The PRS-300 is slightly smaller than the flagship Touch Edition and – lacking some advanced features – is a bit cheaper; about £149.01 compared to £249.99 for the PRS-600. It weighs a little less than your average paperback and is a third of the thickness, making it easy to slip into your bag or briefcase. Sony’s blurb says you can fit 350 books on one device – and one charge gives you two weeks of battery life. Like the Kindle, you can connect to online stores to buy books or download freebies – and there’s support for PDF as well as the industry standard ePub format. Unlike the wirelessly equipped Kindle, you have to connect to your computer by USB to buy or download books. The quality of the screen using E-Ink “Vizplex” technology is the key issue here though. I found it natural and easy to read, with clear type and minimum eye strain – though the background could have been brighter for my eyes. It felt comfortable in my hands, the right weight and a good size. There were one or two niggles. At times the device seemed slow, with a delay between click and response my iPod never prepared me for. And the review version we were sent was hot pink. Brilliant if you’re a fan of Katie Price or Maeve Binchy, but not a suitable home for Chuck Palahniuk or Cormac McCarthy. Fortunately, it’s also available in navy blue and silver. The Sony Reader range is currently available in Sony Centre stores and Waterstones.